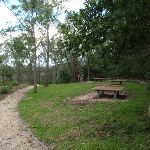 From the ‘Sphinx Memorial’, this walk follows the asphalt footpath, behind the picnic tables gently downhill for about 50m to a T-intersection with the ‘Sphinx Fire Trail’. 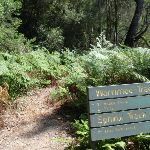 Turn right: From the intersection, this walk follows the ‘Sphinx Fire Trail’ sign gently downhill along the wide trail, keeping the valley to your left for just over 10m to an intersection marked with a ‘Sphinx Walking Track’ sign (on your left). Veer left: From the intersection, this walk follows the ‘Sphinx Walking Track’ sign fairly steeply down the series of timber steps. 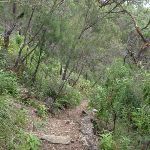 This walk follows the rocky track and timber steps for 300m to flatten out and pass between two tall eucalyptus, then just shy of 150m later this walk comes to a shallow sandstone overhang (on your right). 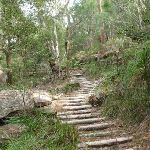 The mostly flat track continues along the side of the valley for about 30m to then head down a series of and carved stone and timber steps for 50m to cross a usually small creek on a sandstone rock platform. 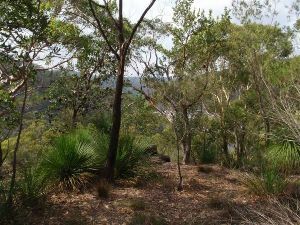 From here the track leads gently downhill along the side of the valley among the grass trees for almost 200m to cross a smaller often dry creek on a sandstone rock platform. 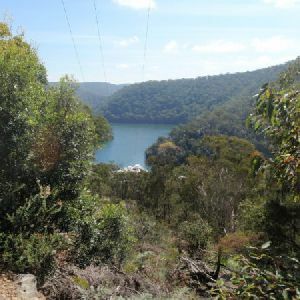 Here the track gently undulates along the side of the hill crossing a few pleasant rock platforms for 130m to pass under the high tension power lines. 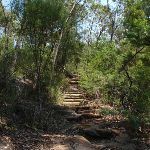 Now the track begins to zig-zags quite steeply in places, for almost 250m, down a series of timber and stone steps to a T-intersection in a flat ferny forest. 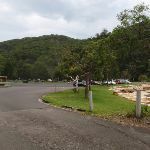 Here there is a ‘Sphinx Track – Nth. 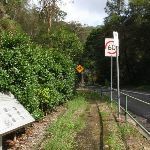 Turramurra’ sign pointing back up the rocky track. 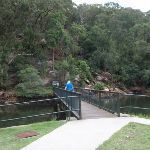 Turn left: From the intersection this walk follows the ‘Bobbin Head’ arrow on the ‘Warrimoo Track’ sign along the clear track that leads through the mostly flat ferny section, keeping Cowan Creek some distance to your right. 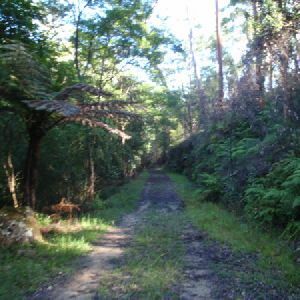 After about 100m the track leaves the ferns and passes under a set of high tension power lines where the track undulates along the side of the hill close to Cowan Creek crossing a few small gullies for about 900m to then pass along a long natural sandstone wall. About 150m after this wall the track leads just below a notable sandstone overhang (up to your left) where the track then starts to head downhill for just over 100m to a fairly open grassy salt marsh. 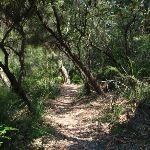 The walk stays just to the left of the salt marsh then leads along the edge of a section of mangroves for 100m where the track bends left and leads along side the creek for another 100m to then cross a creek at a wide rocky gully. 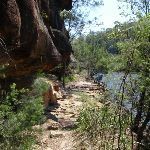 This is a pleasant cool spot with the usually small creek flowing over the sandstone rock platform with naturally carved holes. 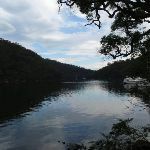 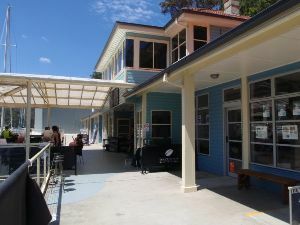 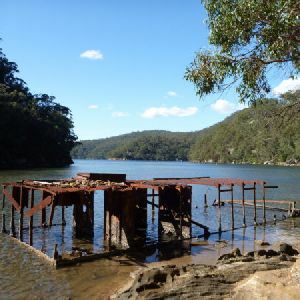 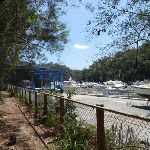 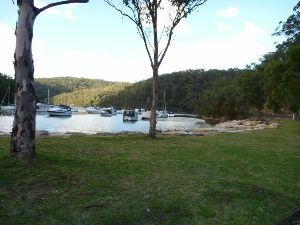 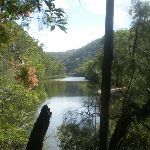 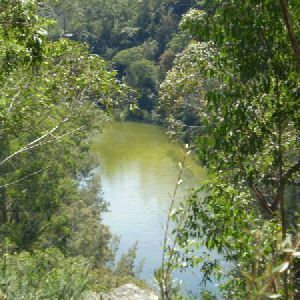 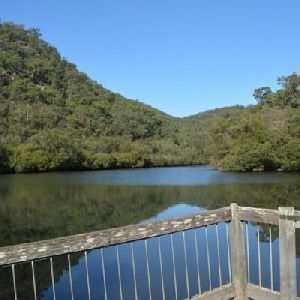 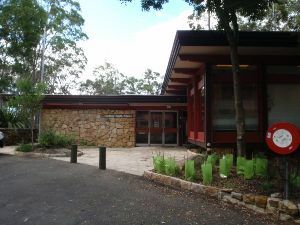 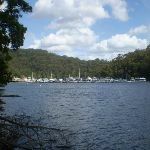 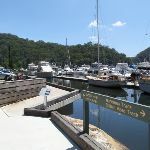 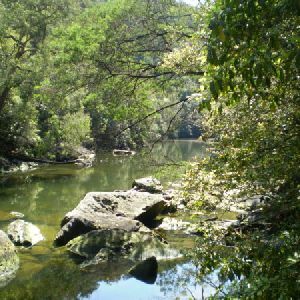 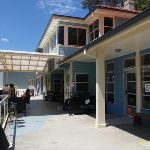 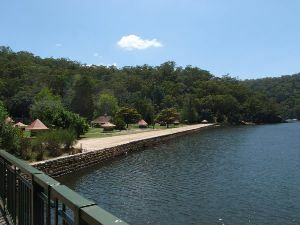 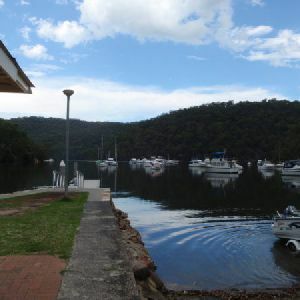 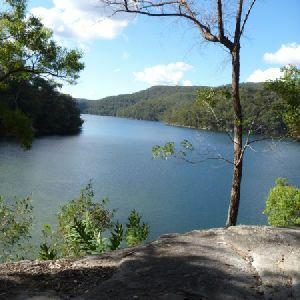 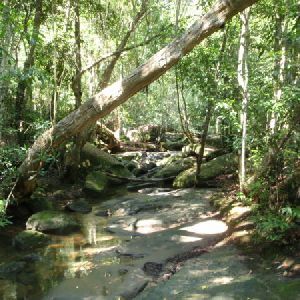 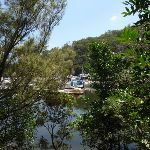 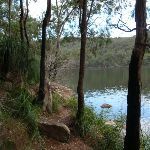 For the next 200m the track undulates gently along the foreshore through the casuarina forest to come to a tall overhang that is on a rock platform right on the edge of Cowan Creek, a pleasant place to rest. 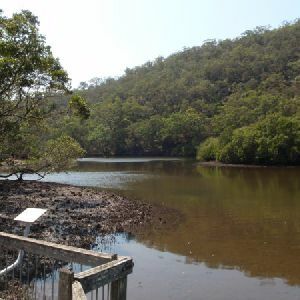 This section of track may become covered with water at high tide. 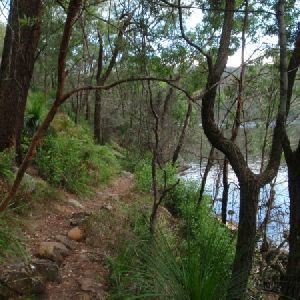 From the tall overhang the track continues along the shortening natural rock wall for about 150m to then lead along another section of mangroves for 150m. About 60m past the mangroves the track crosses a short flat timber bridge, then over the next 200m the track crosses a mossy gully and densely forested gully where the rocky track climbs over a rise, past some large smooth bark angophora’s then down to another tall and long rock wall and some more pleasant water views. 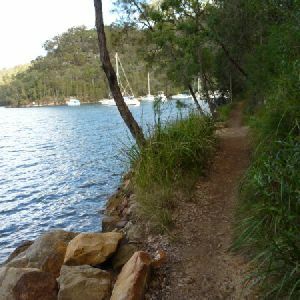 Just 20m past this rock wall the track bends left and leads alongside the edge of the mangroves for 200m, were again the track may be covered with water at high tides. 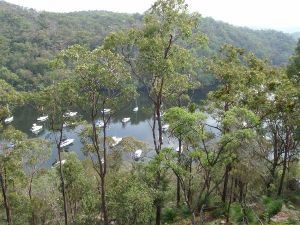 From the end of the mangroves the rocky track climbs for about 200m before continuing along the water side through a casuarina forest as the track gently undulates over some rocky sections passing some pleasant water views for 400m to pass below another fairly large sandstone cave/overhang (up the hill to your left). 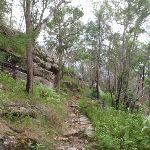 Over the next 250m the track leads through a grassy section beside the creek before crossing a shallow gully over a scattering of sandstone blocks. 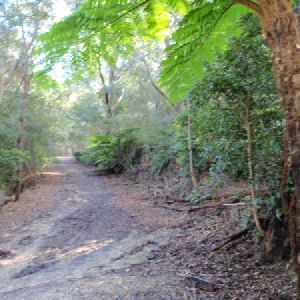 Over the next 300m the mostly flat track leads through a tall wooded forest filled with ferns and crossing a few middens to come to an three-way intersection, just before the marina, marked with a ‘Warrimoo Ave & Sphinx Memorial’ sign pointing back along the track. 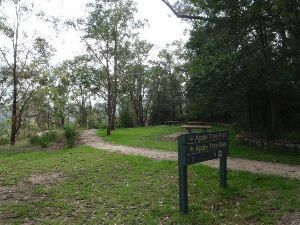 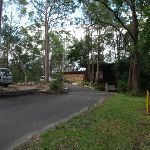 (6.33km) Apple Tree Flat Picnic Area → Int of Apple Tree Bay Road and Apple Tree Flat bushtrack. 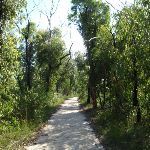 5km of this walk has short steep hills and another 2.3km has gentle hills with occasional steps. 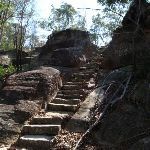 Whilst another 2.2km is very steep and the remaining 1.2km is flat with no steps. 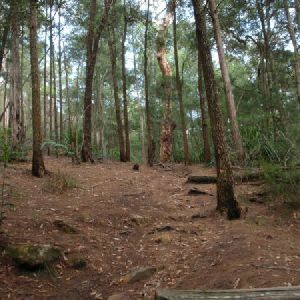 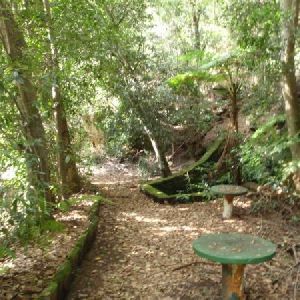 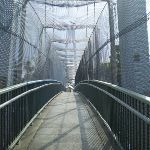 9km of this walk follows a formed track, with some branches and other obstacles and another 1.1km follows a clear and well formed track or trail. 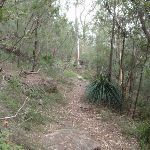 The remaining (1.1km) follows a smooth and hardened path. 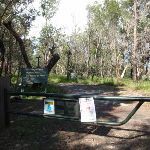 Around 7km of this walk has directional signs at most intersection, whilst the remaining 3.3km is clearly signposted. 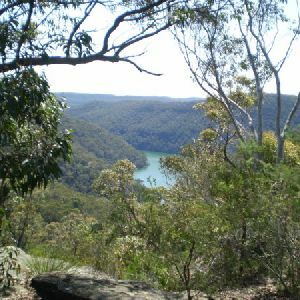 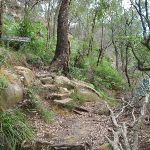 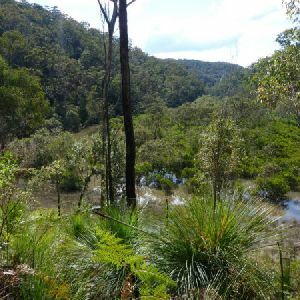 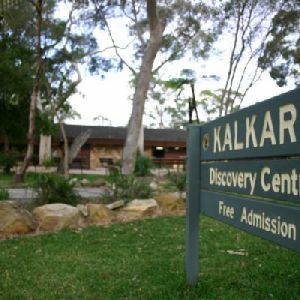 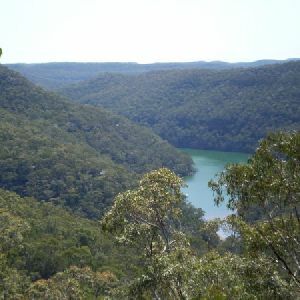 Around 8km of this walk requires some bushwalking experience, whilst the remaining 3.1km requires no previous bushwalking experience. 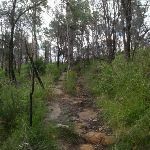 Around 6km of this walk is not usually affected by severe weather events (that would unexpectedly impact safety and navigation), whilst the remaining 4.8km is affected by storms that may impact your navigation and safety. 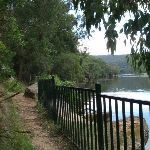 Around 7km of this walk has limited facilities (such as not all cliffs fenced), whilst the remaining 3.7km is close to useful facilities (such as fenced cliffs and seats). 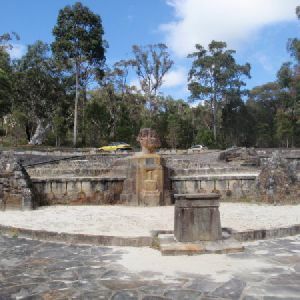 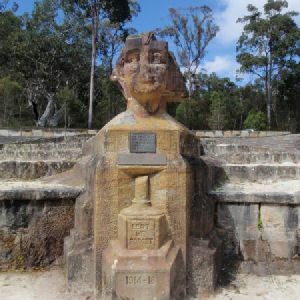 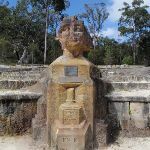 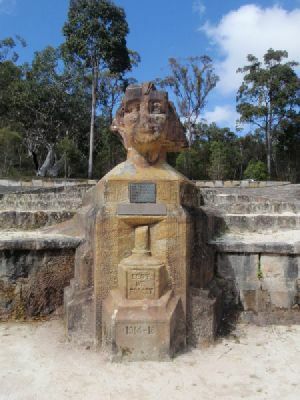 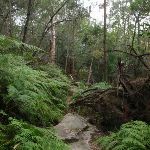 A list of walks that share part of the track with the Sphinx to Mt Kuring-gai walk. 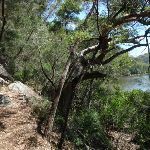 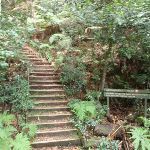 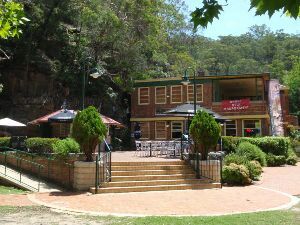 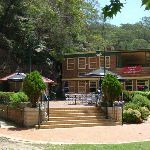 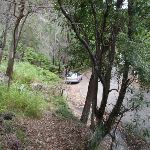 A list of walks that start near the Sphinx to Mt Kuring-gai walk. 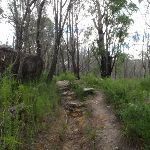 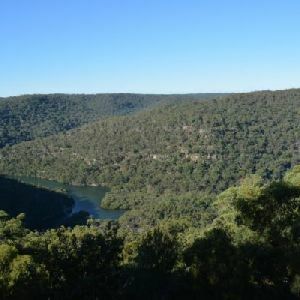 http://new.wildwalks.com/wildwalks_custom/includes/walk_fire_danger.php?walkid=nsw-krgcnp-stmk Each park may have its own fire ban, this rating is only valid for today and is based on information from the RFS Please check the RFS Website for more information.